Hey, I got a prediction right for once! 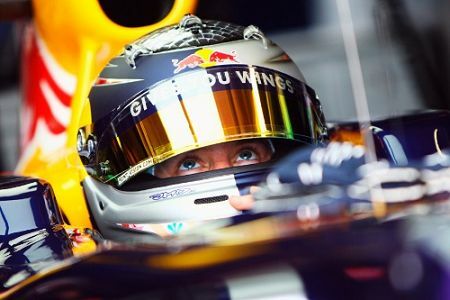 Vettel edged out Button for pole in a frantic last few minutes of qualifying in Istanbul, while Barrichello slotted into third and Webber grabbed fourth. So the expected two best teams occupy the first two rows of the grid and remain the class of the field. Brawn GP left it late, however, being satisfied merely to get both cars through Q1 and Q2 and saving the best for last, while Vettel was quickest in all three sessions. Although Trulli set a final time very close to Webber's, it is likely that he was pretty light on fuel, his team mate, Glock, failing even to make it into Q3, and so the race winner will almost certainly be one of the four at the front. Which one will depend on fuel loads; the one who can run the longest being in the best position to control the race after the first pit stops. The Ferraris were quick but not quite in the same class as the Red Bulls and Brawns; if they are heavy on fuel, the podium may beckon. But I would guess that all of the top ten are on about the same amount of fuel, the times being as close as they are - half a second separated pole from tenth spot. No heroics from Alonso this time out, therefore, and his eighth grid placing is probably representative of the capabilities of the Renault. Rosberg did his usual workmanlike job for ninth and the Beemer boys, next up, restored the team to respectability after the embarrassment of Monaco. McLaren, however, were a big disappointment, with Hamilton failing even to make the cut into Q2. The car looked nervous on this circuit and it seems the team still has a lot of work to do if it is be a factor again this season. Meanwhile, Mercedes customer, Force India, have improved to the point of arguing with Toro Rosso and Sutil squeaked through into Q2 this time. Strategy will play a big part in deciding the victor tomorrow and the best bet has to be one of the Brawns therefore. With Ross on the pitwall, they will make few mistakes in that department this season. But I quite fancy Vettel for a change; the car is quick on this circuit and the team must surely be learning from their previous strategic mistakes. Vettel is significantly lighter than anyone else at the front. If he can't build a lead he could come out of the first round of pitstops 4th or worse. Kimi is heaviest of the front 8, but I fancy Button to do another Schumacher style run. His toughest competition may be Webber who is about the same on fuel. Should be very interesting. Yes, Vettel is perhaps a couple of laps lighter on fuel than Button and so may be passed in the first pit stops (assuming that the race starts as per grid order). Webber looks good in 4th on the same fuel load as Button, Barrichello has a lap less. The only surprise is Alonso's very light fuel load. The Renault must be worse than we thought on this circuit. I have no confidence in Red Bull strategy wise. Ross owns them! Look out for the Ferraris. I don't think they will win but they may snag a podium. Agreed, Steve - Red Bull has lost out to Brawn strategy so far. But I guess they have to get the occasional lucky one. I'm not convinced by the Ferraris, however. Quite a few drivers will have to drop out or make mistakes for Massa or Raikkonen to reach the podium.